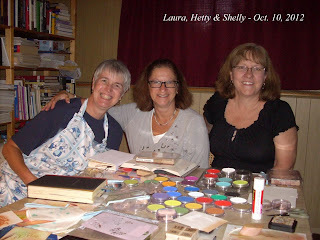 This week at the Sweet Stamps Challenge we are creating with the Black Magic technique. I am thinking this may be my first time trying this technique- I will be trying it again! I stamped the image with White Pigment ink and let it dry, then colored over it with Prismacolor pencils. I added White Paint Pen dots to finish off the look. I joined a Swap last month to made Oriental themed cards that had a dragonfly on them. I stamped the dragonfly by Michael Strong Stamps in Versamark on a sheet of pulled color background- by the Technique Junkies....and embossed it in Gold. The BG is Washi paper under the Cheery Lynn Japanese Wall Die. The Panel is backed in gold CS on red. The red background has a retired SU Poetry Script in Versamark. The sentiment is from SU Kanji, (also retired) stamped and embossed in Gold. The next card is by Bonnie Waliezer. Sandra Grimes swapped an elegant card beautifully done! That the Autumn season has begun is decided by the appearance of the red dragonfly. Shenzhen is North East of Hong Kong and is where my daughter is living this year- teaching English. I made a quick card for the OSA (that is a Yahoo group) Sketch challenge #195. I had this Pulled Color background (learned it in a Technique Junkies newsletter). I used an image from a collage sheet and Washi paper from Art Neko. I outlined the image and each border sheet with a line of Sakura Gelly Roll pen for shimmer. CAS for me, isn't it??? 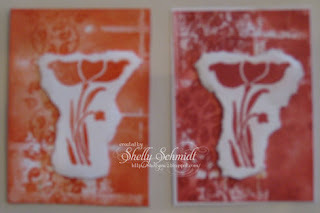 This week at the Sweet Stamps Challenge we are creating with the Burned Embossing technique . For the die, I used cardstock and sponged on the Ranger Distress Ink- so it would coordinate with the sponged colors on the front panel. The background has the image stamped in the clear ink for a watermark effect. This card fits into a 5 1/2 x 5 1/2 envelope. What do you think? I hope you will join us this week! 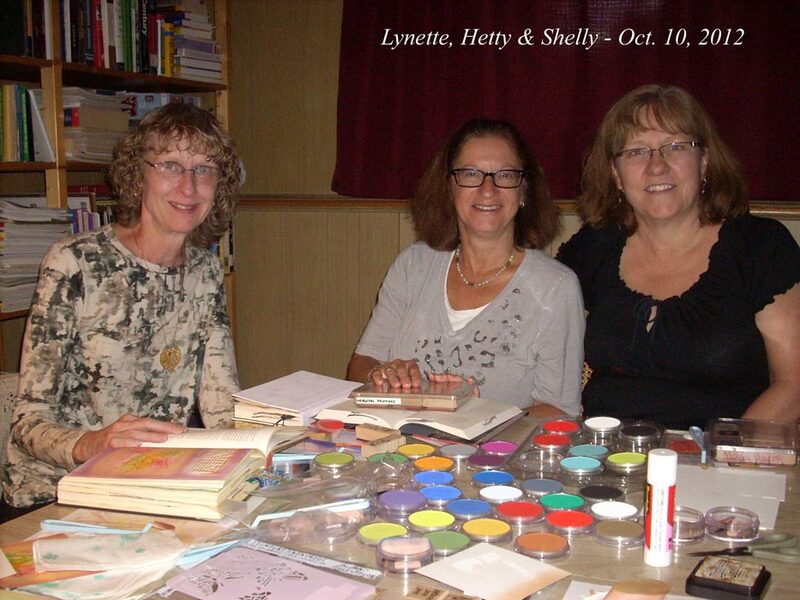 This is Lynette, Hetty and I.
Loretta and Hetty made book pages, we also worked with Gesso and stencils that Loretta shared, and we made card fronts with Pan Pastels.....plain and embossed with CB folders. I am in Cinci with my Mom and Dad this week. Mom had surgery last Monday and is still in the hospital...I am heading home tomorrow... I am not sure when my Mom will be discharged from the Hospital- I am hoping in the next couple of days. 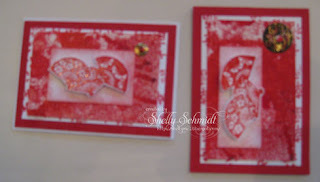 This week at the Sweet Stamps Challenge we are stippling or sponging. I stamped the newly released image Queen Anne's Wildflower Silhouette in Brownie shades die ink onto text DSP from the Kaisercraft Black and White Timeless 6x6 pad. I used another newly released image on the card background from the Decorative Elements set HERE. First, I randomly stamped the image, then I sponged the Kraft cardstock in brown. 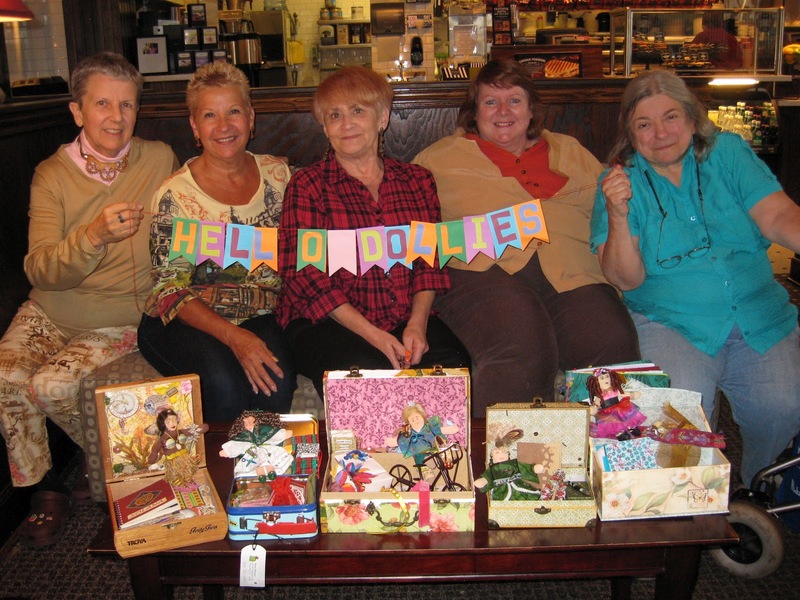 The layout is a CASE from Judy Jackson's newsletter sample. This is another new image from the new release called Mums the Word. 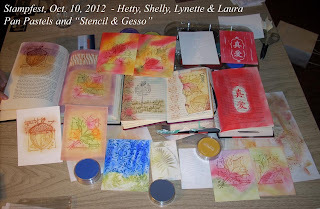 I joined a Yahoo Group called Oriental Stamp Art- I am finding it to be an active board with alot of inspiration, tons of mingles and swaps....... I joined a Mingle for a card with two or more Cranes images a few weeks ago- my partner should have rec'd my card by now, so I thought I would post it today. I let the Washi paper dictate the color of the card....you know I love pink..... The Wedding Cranes image is by Art Neko (and is on sale for just $1.00 currently.......). The sentiment is from SU Kanji. I colored the image with Copics. The cranes are stamped twice- I fussy cut them out and added shimmer with a Sakura Gelly roll pen. I added some texture with an embossing folder, and took out a stippled pink UFO that is very shimmery and added that under the image, added a piece from the MS punch and under the sentiment. There is a gold shimmery threads in the Washi paper too. The Crane is legendary in China for being the prince of all feathered creature on earth. Next to the Phoenix , the Crane is the most favored all Chinese bird symbols. The Crane is the ancient symbol for longevity because of its exceptionally long life span. In many legends, the spirits ride on cranes, which are also said to bear the souls of the departed to the heaven. This week at the Sweet Stamps Challenge we are creating cards using the Black Magic technique. Stamp the image is White Pigment ink, and once dry- color over it with Prismacolor pencils. Add highlighting with a white paint pen. (Mine was not cooperating, so I used White reinker and a skewer stick). I think this is the first time I have done this technique- I will be doing it again....! I found this jar at Target- and purchased it (a year ago to alter...... hehehe) .... The project was inspired by the chilly weather here....... I think this year, I will be making this for gifts for the Holidays- what's better than Hot chocolate??? 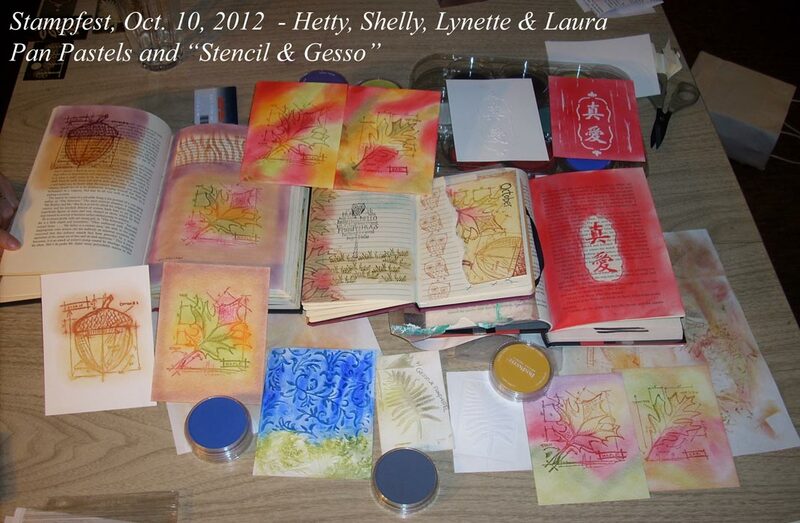 I stamped the images on Glossy paper with Tuxedo Memento ink. The larger image is actually a flower...but I thought it passed beautifully as a snowflake too..... I dauber on Ranger Blue inks one at a time. The image is also on Glossy and colored with Ranger Distress Inks. I simply measured around the jar, and ended up making two 11" strips for the center of the jar. The darker blue shimmer accents are made using a UFO from my Technique Junkies box of backgrounds. The really bad part about not labeling this- I cannot figure out how to make more- it is so pretty and shimmery IRL! Then I decided to make a Rosette with some of the 'UFO' too. There is a piece of glossy CS on the bottom with the lighter blue daubered on...... The flower on top is dimensional- three images stamped and cut apart, then layered. I painted the flower with Azure and SIlver Smoosh paints. I had so much fun with the snowman image, I decided to make a card as well. The card needed something, so I added the dot background and added highlights to the embossed area with Creative inspirations Fairy Dust paint. This is a retired SU set, a Chinese text in the BG and Technique Junkies Colorwash Alcohol for the BG. These images are Rogue Redhead and the background is Acrylic Block taping by the TJ's. Made by Diane S. it has weaving in the BG- papers and ribbon, and a button in coordinating colors to finish it off. Carol, our world traveler just returned from a Steampunk festival in London- and used an embossing folder she purchased there. Cindy made beautiful fall colored swaps- I chose this wonderful leaf themed ATC in Orange. Debbie is a collage artist- I picked a star themed ATC from her collection. And, Mary made a bonus for all of us- she is soooo sweet- for Halloween. The Technique Junkies are celebrating their 10th Anniversary this month- ***giveaways daily***.....just saying. The fun is HERE on Pat Huntoon's blog. Have a wonderful day- and Thanks for stopping by! I made a card using a "Zindorfian" style Brayered Background. Michelle Zindorf held a class in my area a couple of years ago (at my house : ) ) and I always love to 'try' to apply what I learned from her! I stamped and colored the Swan image, colored with Copics and Ranger Distress Markers. Then, I colored over the image with Versamark and clear embossed it. I cut out a circle on a post-it note with a die, then placed it in the center and brayered over it. First, I brayered with Ranger Tumbled Glass Distress Ink, then Stormy Sky. Next, I added Faded Jeans to the outside edges and corners last to make the image 'pop'. The cardstock is coordinations and I added a corner die for a final accent. I was going to try to add piercing across the entire top as an accent, but decided to stop after piercing the top corners. I left off a sentiment so I can use this for any occasion- but think it would make a great Anniversary card......!